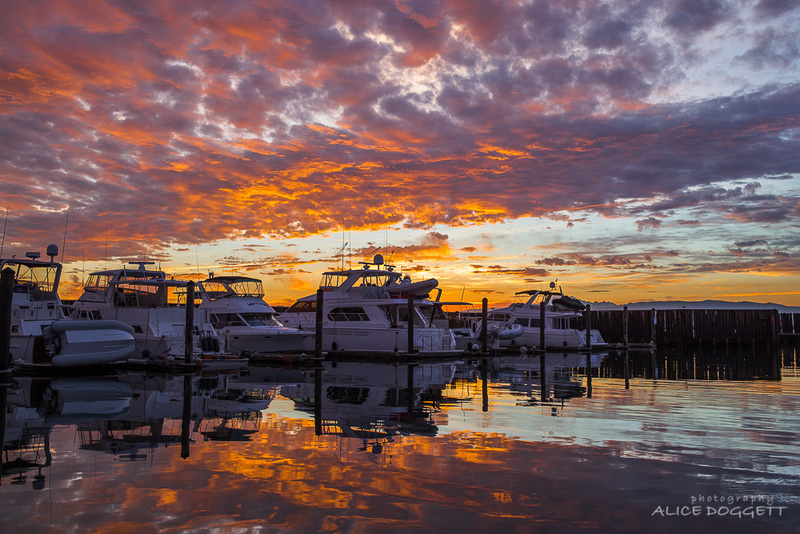 We’ve had some gorgeous sunrises since we’ve been here at Anacortes Marina. This was one of the best. 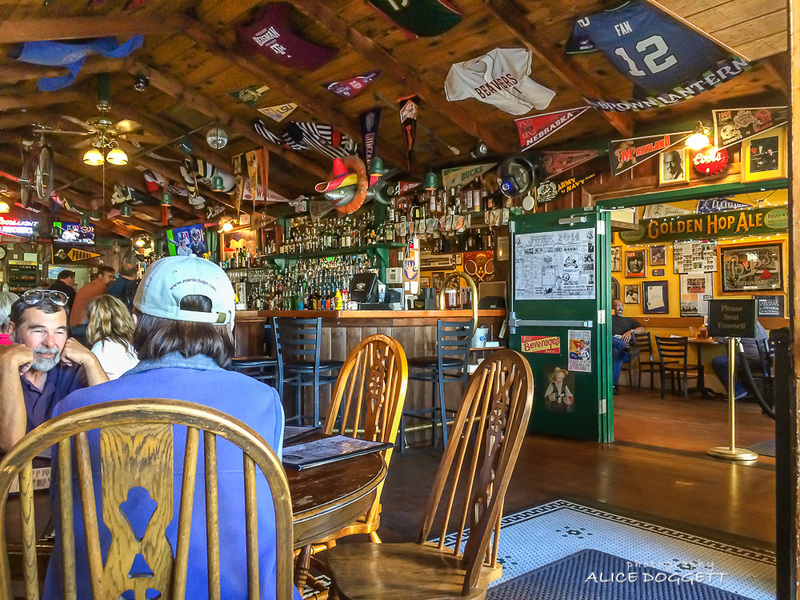 We’re back at Anacortes Marina aboard Phoenix, but unfortunately not for cruising. Last week we received a text message with an attached photo from the woman who washes our boat when we’re gone. 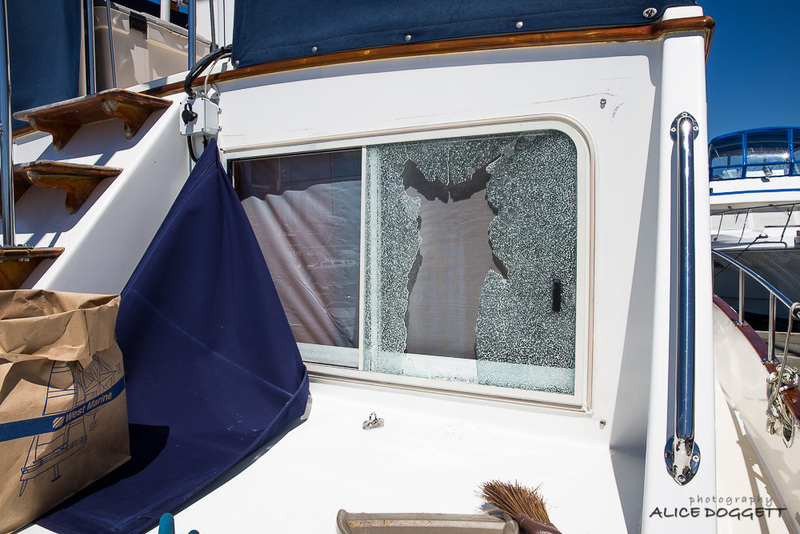 She said, “Look what I found when I came to wash your boat…hope no water got in…call me.” And the attached photo showed one of our cabin windows with shattered glass and a hole in the center! This shows the broken window from the aft deck. The entire glass shattered, and left a large hole near the center of the window. After a few phone calls and help from friends in Anacortes, we determined that the canvas cover over the window had prevented rain from getting inside, and the screen inside the window had protected any broken glass from getting inside. We asked our friends to sweep up any glass they could see, tape the top and sides of the canvas cover with duct tape for more protection until we could get there, and we made plans to leave Bend and head to the boat as soon as we could get organized. It was sunny and calm when we arrived at the marina in the early evening. 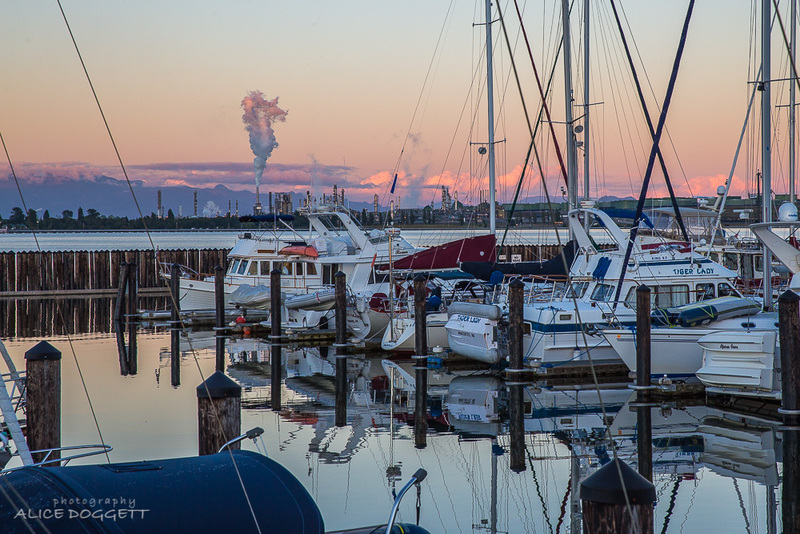 We enjoyed the pleasant view from the marina and the color from the setting sun that lit up the clouds on the horizon behind the refinery. Once we got to the boat, we were relieved to find that there wasn’t any damage inside the boat. There was a bit of glass dust that came through the screen, but it was easily wiped up. We taped a clear plastic tarp to cover the inside of the window for more protection while we removed the shattered glass. This is how the broken window looked from the inside before we taped the plastic tarp over it. If you look carefully, you can see a bunch of broken glass pieces that were caught by the screen and piled up at the bottom of the window. The window that was broken is a sliding window on the aft cabin bulkhead. It appears that something hit it very hard, shattering the safety glass and leaving a large hole. The screen on the inside of the window prevented any broken glass from getting into our cabin, but there were plenty of glass particles that fell down on the deck outside and into the bottom of the window opening where the particles were trapped by the screen. 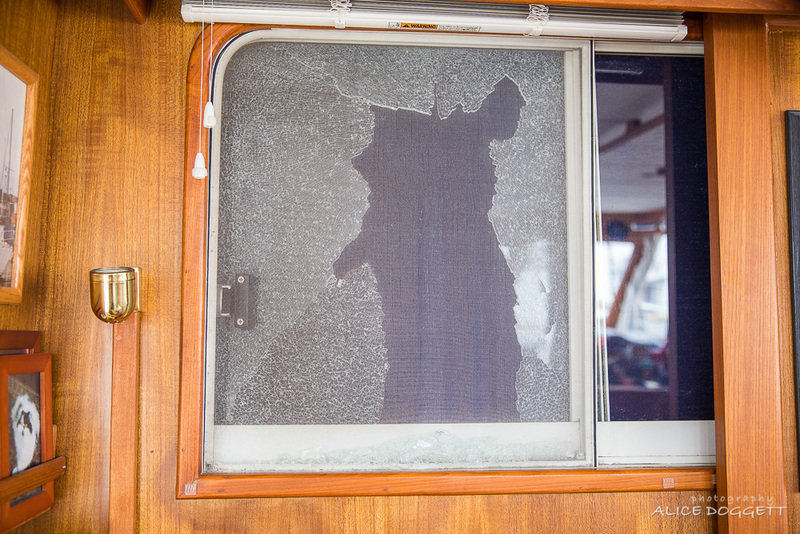 We don’t have a clue as to what might have happened, as this window is in a fairly well protected area on the boat and can’t be reached from the dock. Break-in attempt? Our marina is secured by key entry at each dock. Large bird or other object hitting the window? No evidence (or dead bird) left behind. Perhaps the glass fatigued and self-destructed? It may remain a mystery. All the glass pieces were very small, about one-quarter inch square. And there were thousands of them. Fortunately we had dry weather and were able to work on the aft deck to clear out the glass. We taped sections of the window pieces together, which reduced some of the shattering, because as soon as we touched any part of the shattered window, it fell into pieces. We got the larger sections out, swept up the glass as we worked, then got tweezers and other tools to scrape out the bottom area of the window where pieces of glass had accumulated. Finally we used our old vacuum cleaner to get more pieces out. Once we had the shattered pieces out, we found a glass guy and made arrangements for him to come look at the window. The first challenge was to figure out how to get a new piece of glass into the existing frame. He found a piece of padding inside the edge of the window frame that can be pulled out, allowing room to get the new glass in. Once the new glass is in, he will put the padding back in to secure the glass. We hope this works. Then he measured for a new window. Hard to do without a pattern! He also drew a radius for one corner of the window that is curved. And, he measured for holes that have to be drilled where the window latch will attach to the glass. The holes have to be exact, so we are hoping that the measurements will be right! The glass guy has ordered a new piece of glass to be cut, and it will then be tempered and shipped to him. It should take about a week or maybe a little longer. Meanwhile, we’re really glad the weather has been dry and mild while we wait for glass to cover the empty space where the window should be! After we got the glass cleaned up and talked to the glass guy, we headed over to the Brown Lantern Ale House for burgers. This entry was posted in Life Aboard, Maintenance and tagged anacortes, Anacortes Marina, boat maintenance, broken glass, Brown Lantern by Sailor Lady. Bookmark the permalink. Thanks, Bob. Guess we missed quite a storm in Bend earlier this week, with thunder & lightning and even some smoke. Good weather here so far…on the Fourth, we had sun for the morning and early afternoon, then rain came in for the early evening. But it quit before the fireworks and didn’t really rain very hard. Happy to say the kitties survived the fireworks noise.